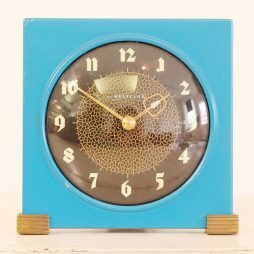 Mid-Century Clocks | Interior Boutiques – Antiques for sale and mid century modern furniture, french furniture, antique lighting, retro furniture and danish furniture. 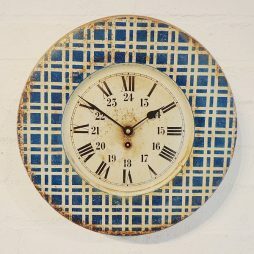 This is a fabulous good sized factory clock from the late 1960's or early 1970's. We have converted it from electric to quartz retaining of course the classic baton hands. The aluminium rim adds that contemporary touch for modern décor. 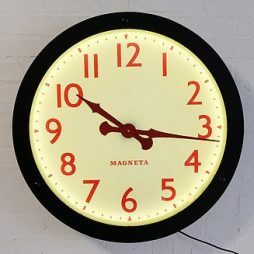 Magneta was an English clock company making electric clocks up to the 1970's and this glass dial, with it's red numerals, has been re-cased and had LEDs installed for illumination. 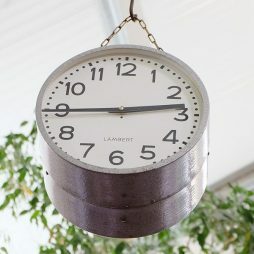 Ideal for a restaurant, cafe, wine bar etc. 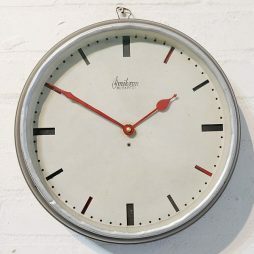 Made in Scotland by Westclox in the 1950's. Originally 2-pin electric which we have converted to quartz keeping the original lovely hands. This is very much a style icon e.g. 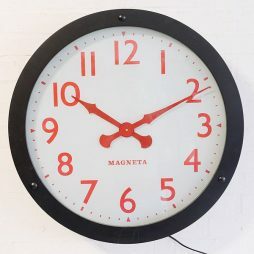 look at the numerals, delicate hands, simple shape and the metal feet. 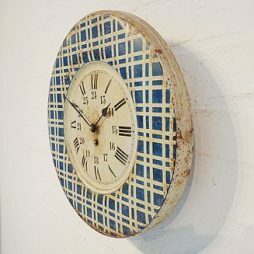 This clock was popular in it's day and was made in a variety of colours. 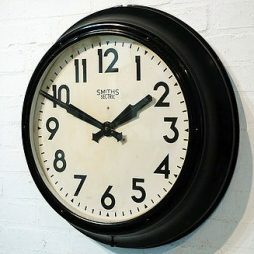 A very popular English wall clock with a Bakelite case made by Smiths in the 1950's. 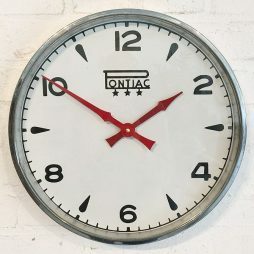 Their logo appears on the dial and we have converted it from electric to a modern quartz movement keeping the distinctive Smiths clock hands of the period. 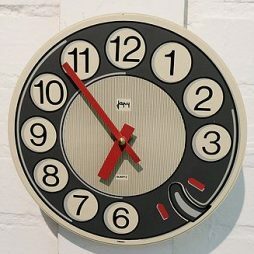 A good size and therefore impressive double-sided hanging wall clock from the 1970's. 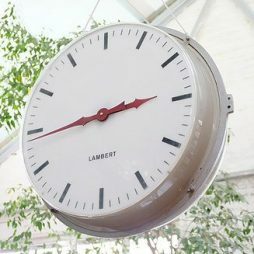 Made by Lambert, one of the leading electric French clock companies, who specialized in plastic and perspex clocks of a contemporary nature. Fitted with quartz movements on both sides. 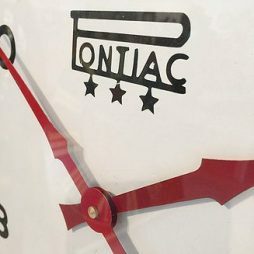 A quality clock made by Pontiac, a famous watch brand from Switzerland. 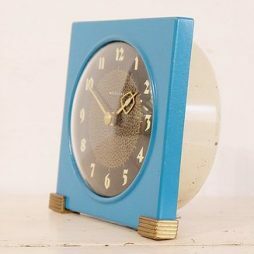 The chrome casing is in very good order for a clock that is more than 50 years old. Now converted from electric to quartz. The style of numerals is particularly interesting. This is not a common model to come across. 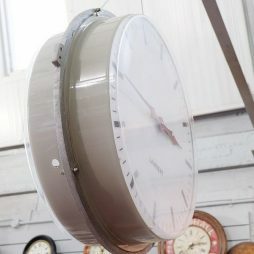 A compact metal cased hanging double-sided clock by the French clockmaking firm “Lambert”. 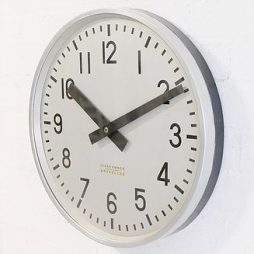 They specialised in office and industrial clocks with Mains power and we have converted this by fitting modern quartz movements to the original hands on both sides. 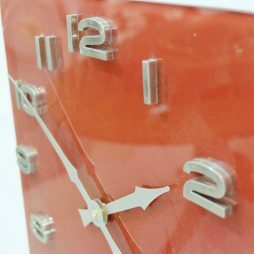 Bought in France, this 1970's square glass wall clock has raised chrome numerals. 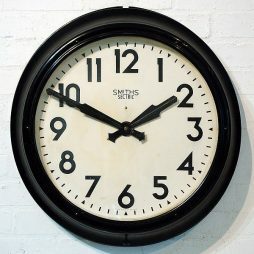 An iconic Smiths Bakelite clock from the 1950's when Smiths had a virtual monopoly on British made clocks. The company started in the 1850's and lasted until the early 1960's. 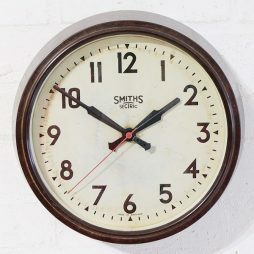 This was originally a wind-up eight day clock, which we have converted to quartz retaining the characteristic Smiths hands. 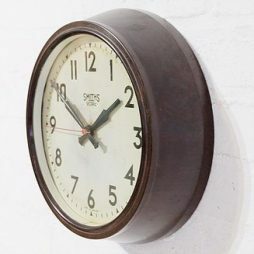 This is in excellent condition and is fitted with a modern quartz to the original decorative hands. 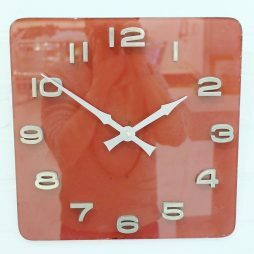 A fun plastic clock with red hands made by the well known French clock company of Japy, probably in the 1980's. 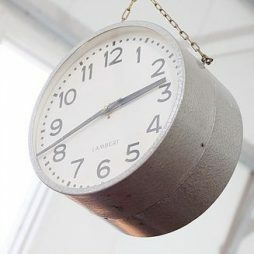 The is the first Hungarian clock we have ever had. 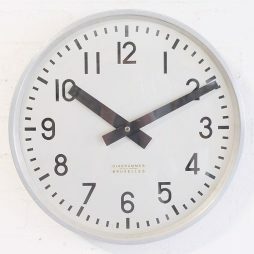 It dates from the 1960's probably and has an interesting feature in that the baton numerals are set behind the cream dial having been fretted out. 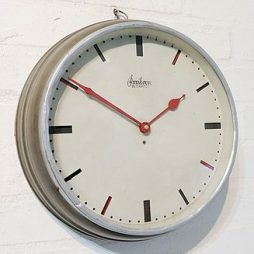 The metal case is in its original industrial grey. It is now fitted with quartz having originally been an electric slave clock.